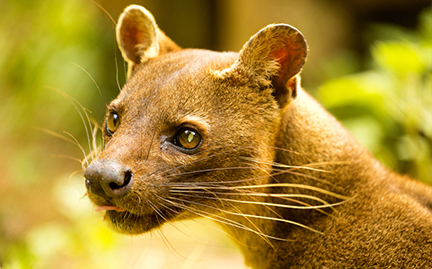 With the exception of breeding season, the fossa is usually solitary. A relative of the mongoose, it walks on the soles of its feet in a motion known as plantigrade. Its short, retractable claws allow for efficient climbing and the fossa’s tail, nearly as long as its body, helps with balance as it pursues prey through the trees.